Minnesota's has packed a lot into a manageable package. Take for instance their Ives Auditorium. Unlike the bulk of auditoriums built between about 1905 and 1929 that seated 1,000 or more (usually for the Scottish Rite), Minnesota decided to downsize to a more reasonable size that suits the current type of attendance they are getting for large Masonic events. It seats 443. 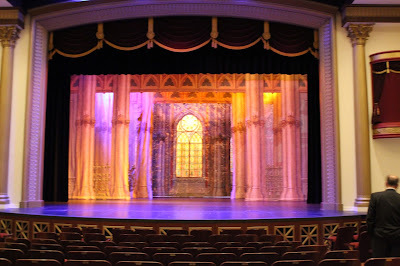 An article was posted yesterday about their stage and the extensive project they have undertaken to obtain, rescue, preserve, and once again use a set of backdrops from the old Scottish Rite Valley of Fort Scott, Kansas (building closed in 2014). These drops were specifically designed for the Scottish Rite SJ's degrees, and so a Masonic theatre may be the only place on Earth that could properly make use of them ever again for anything more than wedding photos or edgy band performances. But this project turned into a huge and expensive undertaking. It wasn't just a case of rolling them up, trucking them north, unpacking them, and rehanging them. I can tell anyone from experience that the simple act of just hanging drops of this size from rigging can be a logistics nightmare, and they are far from lightweight. Complicating the problem was that the architects for the new building and stage designers were given the wrong measurements from Kansas for the length of the Ft. Scott drops when they were first removed and stored, forcing the team to make the tough decision to trim them on each end to fit the rigging system that was already committed to. They have completed work on 27 of the 70 drops so far, and the work continues. Read about it HERE. 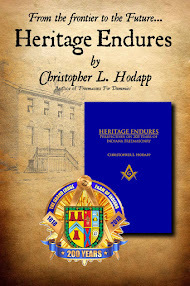 And for much more information than you'll ever want to know about the subject, seek out a copy of the beautiful, informative, and outstanding book, Theatre of the Fraternity: Staging the Ritual Space of the Scottish Rite of Freemasonry 1896-1929, which is a lavishly illustrated compilation of six major academic articles primarily directed to the historical staging of Scottish Rite degrees in theatre settings by Kenneth Ames, Will Moore, C. Lance Brockman, Mark C. Carnes, Mary Ann Clawson, and Lawrence Hill. Published in 1996, it's out of print, but still available if you look around. 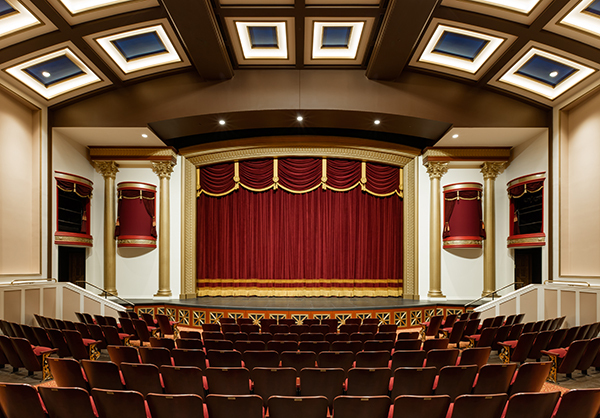 My name is Wendy Waszut-Barrett, PhD and for almost thirty years, I have specialized in the evaluation, restoration and replication of historic scenery for Masonic theatre. Past projects include the Scottish Rite collections in Danville, Virginia, St. Paul, Minnesota, Santa Fe, NM, and McAlester, OK. Examples of my own restoration work and restoration experience can be found at www.bellascena.com in case you want to verify that I have an experience or credibility to comment on this post. My doctorate examined the integration of theatrical scenery into Scottish Rite ceremonies in both the Northern and Southern Jurisdiction. I am also a SRRS scholar published in Heredom. Unfortunately, the Fort Scott drops have been destroyed beyond repair as hot melt was used on fragile paintings. The scenes have been further butchered by being cut and any historical integrity destroyed. This had been a collection of international significance. The individuals who completed the work had no prior experience with either creating or repairing historical scenery. The article posted about the restoration is incredibly misleading and full of incorrect information. I was the one to evaluate and transport the Fort Scott collection in 2015 and it was in pristine condition, created by Thomas Gibbs Moses in 1924. Having restored over 500 historical backdrops, I can personally vouch that those who have prepared the scenes for hanging have destroyed this particular bit of shared heritage between the Fraternity and Theater. I have presented and discussed the history of the Fort Scott collection and its destruction in great detail -see "Tales of a Scenic Artist and Scholar: Acquiring the Fort Scott Scenery Collection for the Minnesota Masonic Heritage Center" available at www.drypigment.net This is a very sad day for the Fraternity. Thanks for the follow up, Wendy. I knew nothing about the current installation project in Minnesota, only about the storage of the drops when they were first removed in Kansas. But my alarm bells went off when the article said they had to be cut to fit the new stage. Then pigment coming off in the "cleaning" process...? My father used to describe certain events as a "yay - boo" situation. Yay that the drops are going to be back in use instead of eternally warehoused in forlorn hope of *someday* being installed *somewhere*. But this project sounds like it was mishandled by people out of their depth, I'm afraid. Hence the boo side of it all. 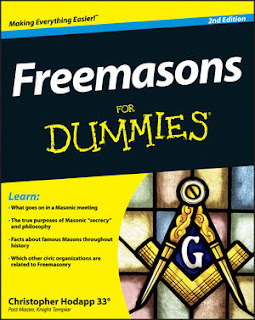 There has been such an enormous loss of Masonic history --just look on Ebay as every day fragments of it are sold off. In many cases, just a modest amount of good management and expertise would have saved the day. It casts doubt on the leadership, as of course do public relations disasters like the Alexandria lodge fracas, the New York - Scotland civil war, and so on.